Things have been a little hectic the last few days, so apologies for week 10 of #OneBlogaWeek actually arriving in week 11! Firstly, Sunday is the new Friday! From now on #OneBlogaWeek will be arriving on the sabbath. Thirdly, here’s a free download of a cover of the song on that advert. It was recorded live in session for XFM a few years ago. 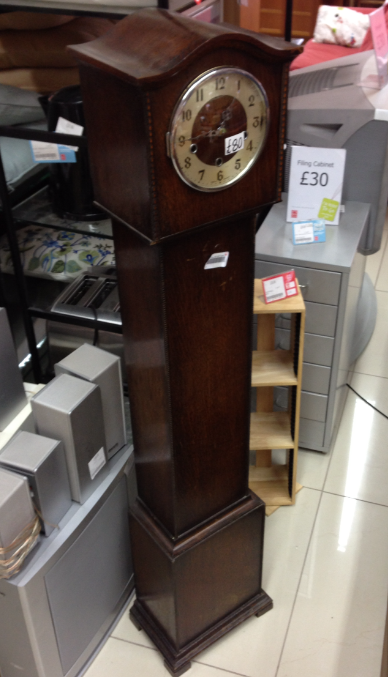 Fourthly, here’s a photo of a grandfather clock I bought (from a charity shop in Brixton) to put onstage for the show at The Garage in Islington. £80! Fifthly, that’s all. I’ll be back on Sunday with week 11 of #OneBlogaWeek featuring my thoughts, some photos and maybe even some videos from Monday’s show. Seventhly (this is getting silly now), that really is all. Tiny Chemicals… Here’s the blog.